The first (and only so far this year) book I have read for the Postal Reading Challenge is "That Part was true" by Deborah McKinlay. Someone posted about this book in the forum at Lettermo and I thought it sounded great. I went to Bigw and bought a new copy. I started it straight away thinking I would love it. However I found it a bit dull and it just sort of tumbled around until the end. Mostly about Jackson's love life really and not as much about the relationship between him and Eve. It was good but not great like I was expecting. People comparing books to "The Guernsey Literary & Potato Peel Pie Society" doesn't necessarily mean they will come close to being that good. This year I am participating in 2 reading challenges. 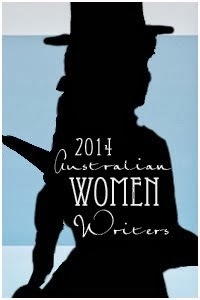 The first is the Australia Women Writers Challenge. I already read a lot of Australia books anyway, and I found the challenge while looking for something else so decided to join it. The second challenge is the Postal Reading Challenge hosted by TheIndextriousreader. "S" by JJ Abrams and Doug Dorst. I wanted to love this book... a book with letters and cards and postcards..I couldn't wait to read it. I loved The Griffin and Sabine books and we have heaps of kids books with letters and extras, every time I find a book with "extras" I add it to our bookshelf. "S" however left me confused and bewildered. I liked it but I didn't love it. I'm sure I missed some things, I couldn't figure out when some characters entered the discussion in the margins, I still have no idea who some of them were or how Eric and Jen discovered them. I enjoyed Eric and Jen's letters to each other the most. The "Ship of Theseus" story was a bit slow at the beginning, but the last few chapters were a lot better. I thought the end was a bit of a let down though. I'm sure I missed some things simply due to having a toddler and not being able to concentrate on the book fully. I wasn't sure if there were more secrets to hunt for or codes to break. It's definitely the kind of book I'd like to buy to keep, to pick up again now and then and to re-read just Eric and Jen's notes in order. "Abrams: The idea came to me when I was at the airport. I saw a paperback novel sitting on a bench, and I went to pick it up. Inside, someone had written, in pen, “To whomever finds this book—please read it, take it somewhere, and leave it for someone else to find it.” It made me smile, this optimistic, romantic idea that you could leave a book with a message for someone. It reminded me of being in college, and seeing the notes that people would leave in the margins of the books they’d checked out of the library. And then, I started to think: what if there were a very cool book that was completely annotated—just covered in marginalia and notes between two people? And—what if a conversation, or a relationship, began inside a book? That was the beginning of the process, maybe fifteen years ago." THIS BOOK WAS WRITTEN BECAUSE OF (what sounds like) A BOOKCROSSING BOOK!! That is awesome! Maybe,like LOST, it was just supposed to leave me wondering...? and as part of a Bookcrossing bookring. The second in a series, this one was probably a bit more realistic then the 1st. The letters are still arriving addressed to Sherlock Holmes. Reggie is working on a case involving one of London’s Black Cab drivers who is accused of murdering two American tourists, and at time it seems like he has made the wrong decision taking on the case, but it all works out in the end. Aubrey is an 11 year old girl who lost her father and sister in a car accident. Her mother, unable to cope with the grief, leaves Aubrey alone. Eventually her grandmother arrives and takes Aubrey home with her. Aubrey writes letters to her sister's imaginary friend as she learns to adjust to her new life without her sister, father or mother. The main character in this book works as a Postlady. Her father is the local parcel delivery man. A bit of a light hearted book, after a few heavier ones. Holly has started thinking about having a family one day, but first she wants to find out more about her birth mother. She hires a private investigator and doesn't plan on falling in love with him! I loved this book, though it reminded me a lot of " The Guernsey Literary and Potato Peel Pie Society", (which I also love.) Spanning 2 wars, it tells, in letters, the love story of Elspeth and David. I looked up where Skye is on a map, and added it to the list of places I'd love to see one day. This book had far too many characters and it took me longer to read as I kept flipping back through trying to work out how they were all connected. Someone steals the mail from the postbox, then dumps it in a nearby lane and 2 police have to read through the mail in the hope of finding out who stole the mail and why. A funny idea but far too complicated, some laughs especially the letter concerning local dogs and their business, but mostly, just too long and involved. Book22-The Household Guide to Dying by Deborah Adelaide. I had read this before, but I received a copy in the mail as part of a Bookcrossing Bookring. So I decided to re-read it as it had been a few years since I read it. I really enjoyed this last time I read it, but this time I hated it. Life experience has changed my opinion and I just wanted the main character to stop wasting her time she had left. I found the idea of a Household guide to dying tasteless and sad. A friend send me this (and a few other books) for the reading challenge. This one took me a long time to read, I found it tedious and dull. It may have helped if I knew some of the names mentioned, but probably not. Even with all the places the 2 sisters went and all the fun they had, I still found it boring. A bargain book I picked up in Kmart for $3. Teenagers Jess and her sister Margaret are intrigued by their neighbour and her house full of interesting things. When Edith's house burns down, their mother suddenly leaves their father and Margaret develops an eating disorder, Jess tries to hold everything together. Nobody knows Margaret has Edith's letters, telling of her travels as a young woman and also of a secret she's kept to herself. My collection of stamps, mostly from KikkiK, Typo and Spotlight. I enjoyed this more then I expected to. Rather unbelievable in places, but an interesting read. I rather liked the idea of someone answering letters from years before. I wonder if people really do get letters addressed to fictional characters? I've just realised as I've looked this book up on Goodreads, that this is a series! I'm happy to see that, I'll have to look for more of them now. I will admit to seeing the movie before reading the book, and I really think people should do it in that order. The book explains so much more then the movie. I read this as an ebook, (which I'm still not overly thrilled with and can't read more then one at a time of) as I didn't want to wait for a library copy. My daughters best friend is always talking about TPOBAW and quoting lines from it. I am surprised I'd never heard of it before now. I think Charlie probably needed some more help. Probably in a 2013 setting he would have gotten more. I liked Charlie and I hope he was happier eventually. In this case Going Postal isn't a Terry Pratchet novel or a killing spree! A Bookcrossing friend of mine sent me this for the Postal Reading challenge, she didn't mention that Nathan buys his postie bike from my home town! Nathan decides, when his visa runs out, that he will ride a postie bike home to England. 9 months and 18 countries! Nathan has a website thepostman with a map of the route he took and pictures etc. I loved reading about all the different places, but thought the last part of the book was a bit rushed, there was not as much writing about Europe as there was about Nepal and India. The books still on my Postal Reading Challenge "To be read" pile.